Does the school have a longstanding reputation for delivering high-quality instruction? The Boston Language Institute has a world-wide reputation for excellence in ESL and foreign language instruction with over 67,000 graduates since 1981. The TEFL Certificate Program, created in 2000, has trained over 1900 teachers to date. We are proud that the directors of other language schools refer ESL teachers and prospective teachers to our TEFL Certificate Program and give priority to our graduates for teaching positions in their own ESL programs. Can you easily contact the school by phone or email? Will they take the time to answer all your questions and to give you thoughtful advice? Our program coordinator will personally and promptly respond to your inquiry and will make sure you receive all the information and guidance you require. We understand that taking a TEFL training program is a major investment of time, energy and money, and we want you to feel confident about the decision you make. Can you visit the school and participate in a training session before you apply? Will the school permit you to contact current trainees or program graduates? We encourage you to spend a half day participating in a TEFL training session and to speak with the program coordinator, trainers and current trainees. We will also gladly put you in touch with graduates with whom you share interests. Is enrollment limited to a maximum of 12 trainees per class? When enrollment in any session of our TEFL program exceeds 12 trainees, a second class is opened to accommodate the additional trainees, and each trainee is assigned a lead trainer to whom he or she can address all questions or concerns. Does the school offer a choice of both intensive (weekday) and part-time (Saturday) programs? Does it dependably run the scheduled sessions? We offer 11 weekday and 3 part-time programs per year. We have never had to turn a trainee away because of a cancelled session. Does the school offer special TEFL Certificate programs for non-native speakers of English? The Boston Language Institute poineered both full-time and part-time programs designed to address the unique needs and concerns of non-native speakers. These programs, in which extra attention is given to teaching pronunciation and grammar, are offered each session. Please see our schedule for details. Does the TEFL/TESOL* course provide you at least six hours of fully-supervised teaching experience with real ESL students? Will you have the benefit of extensive feedback given by both your trainers and your peers? You will teach groups of ESL students, both as part of a team and as a solo teacher, accruing a minimum of six teaching hours (a TEFL Certificate standard). Your trainers will give you guidance in the preparation of your lessons, observe your classes from start to finish, and provide you with extensive feedback after each class. You and your classmates will observe each other's practice teaching and exchange ideas once each session is completed. You will also have the option of having one of your classes videotaped for your later review. Will you receive one-on-one attention during the course? Your trainers will offer you the support you need to make the most of the program, including remedial assistance. The Program Director and Program Coordinator will assist you with any administrative concerns you may have. Your satisfaction and success are important to us. Does the school offer extensive and personalized assistance in your job search? Will that assistance continue once the program is completed? In addition to taking part in a half-day career workshop, you will benefit from an extensive array of job search resources, including access to subscriber-only job listings for teaching opportunities both in the USA and overseas. Our Program Director will meet with you in an optional private session to provide job counseling, assist you in preparing an effective resume and put you in touch with professional contacts whenever possible. We will review contracts for you, provide references and introduce you to other graduates teaching abroad or in the United States (see below). These services continue to be available once you have graduated, whether you visit us at the Institute or contact us via email. Will you leave the program with a portfolio that will illustrate your skills to potential employers? Rather than taking an examination at the end of the course, all trainees develop a portfolio consisting of a set of related lesson plans. This project, which demonstrates to us your mastery of course content, later becomes a marketing tool in your job search. Will you become part of a worldwide network of program alumni? Does the school offer a realistic picture of what skills you will acquire during your program and what career opportunities await you after graduation? Does the school offer you a money-back guarantee of satisfaction? The Boston Language Institute is committed to honest representation of our program and of the ESL/EFL job market. We are the only TEFL Certificate Program to offer a money back guarantee. We will refund your tuition if you are not satisfied with the quality of instruction in our program. Please see our application for details of the offer. Does the school keep up with current trends in the industry and is this reflected in the TEFL course content? The Boston Language Institute faculty constantly keeps abreast of new ideas, theories and practices being developed in the ESL/TESOL arena. To that end, the TEFL course syllabus is regularly up-dated to reflect important changes in the field. I want to teach abroad, and would like to study a foreign language before I leave. Can The Boston Language Institute help me with this? 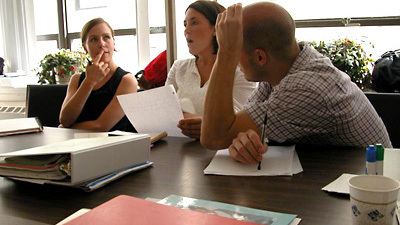 The Boston Language Institute offers a variety of small group and private programs in over 140 languages. As a TEFL trainee and later a graduate, you are automatically in line to receive a 20% discount on any foreign language you may care to study.